Sign up for our CSA during the winter months when you’re dreaming of summer. Pick up your beautiful share every other Friday in July and August. Enjoy our fresh, long-lasting blooms for days! Your flowers are bursting from a black bucket. You get the cream of the crop each week, including blooms like sunflowers, lavender, and lisianthus. Expect delicious scents, unusual flowers, and very, very, very long lasting blooms! Pick up your share between 11 am and 9 pm on alternate Fridays in July and August. We're less than a mile from the Trader Joe's in Pikesville. You can absolutely give a share as a gift, or "share" your share with friends and family. How do I buy a CSA share as a gift to someone? When you purchase the CSA, you’ll fill out a little form with an option to gift the share. Then, we’ll email you a little gift note to print out or email to your gift recipient. Is your farm really less than a mile from Trader Joe’s? Yes! Not to mention the Wine Loft. If you’re grocery shopping, we recommend going to Trader Joe’s first and then picking up your share, since flowers won’t do well sitting in a hot car. Why should I sign up for a CSA? Farmers buy seeds and supplies in the winter, when there’s time to plan the season. But, we don’t have much income in the winter when there’s nothing to sell. 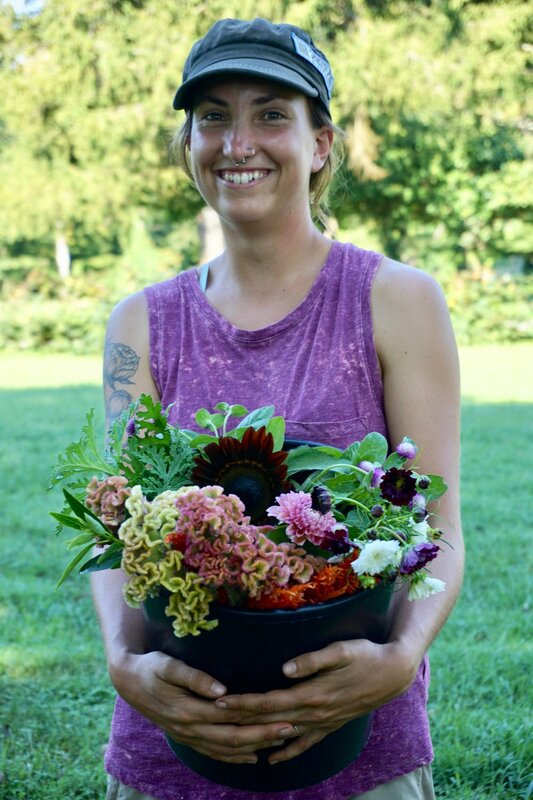 CSA’s are an important way for you to support your local farms during our tight months so that we can give back to you during our summer harvests!